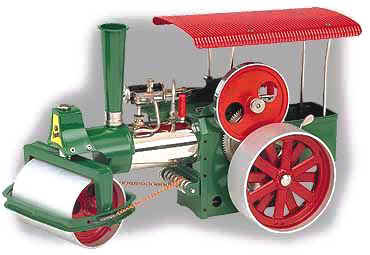 Welcome to the world of Wilesco Model Steam Engines. Click on the links to the left to explore the world of Wilesco. Wilesco steam roller D365 "Old Smokey"
Another quality model steam engine from Wilesco featuring smoke stack, traditional steering wheel chain drive. Flywheel of 8 cms diameter with grooved pulley. Clutch engaged gear wheel, permitting the use of the machine as a stationary steam engine. Operating time about 15 minutes per fuel charge. Anodized aluminium rollers. Finely varnished, matching colours. You will find the full range of Wilesco model steam engines here along with a comprehensive range of accessories and driving models.